One of my subscribers and a friend, Charles Cohen, has allowed me to share with readers an article which he recently wrote on the performance of Warren Buffett and his company Berkshire Hathaway vs Goldcorp. The results will shock you and this is a must read. Thanks Chuck! This article is not intended to denigrate the legendary investor Warren Buffett personally. It was prompted instead by the near idolatrous atmosphere that has arisen recently of not just Mr. Buffett, but his personal vehicle, Berkshire Hathaway. By now almost any investor who is still breathing is aware of the extraordinary record of this company and Mr. Buffett over the past 30 years or so. But what has not been ever really made certain is if, in recent years, this adulation is any longer justified. So I decided to check this out. This week marked the most recent annual Berkshire meeting, one I refer to as the annual religious pilgrimage to Omaha, Nebraska, the home of the venerated Mr. Buffett. Such a visit has its roots deeply in other great faiths of the world. Under the Torah, all Jews were required to make a pilgrimage to Jerusalem, the city of the Great King, the city where the God of Israel dwelled. Islam believers that all Muslims, if they can afford to, are expected to make a pilgrimage to Mecca at least once in their lifetime. But even I was stunned to read that a throng of over 30,000 congregants were flying, driving, walking or crawling, as they might do in Mexico, to the great ingathering in Omaha. I was certain that the article was mistaken, and meant they were heading to a Jimmy Buffett concert, instead. But it was Warren, not Jimmy. However, what really made me decide to investigate Berkshire’s record was the Jim Sinclair article on the recent large derivative loss revealed by the company. This was a strangely unexpected jolt since the Omaha Apostle had prophetically, not profitably, warned the world several years ago in his strongest language, of the potential effects of these instruments. Remember, it was the WMDs that got us into Iraq in the first place, so obviously the financial WMDs were to be shunned at all costs. Who would have guessed that the sagacious Mr.Buffett would have ignored his very own admonition? This derivative loss was part of last week’s shocking revelation that Berkshire’s earnings had actually fallen 65%. Yes, Berkshire Hathaway’s earnings were actually down. Like the fallen angels Berkshire had now assumed the character of mortal companies such as Bear Stearns and Countrywide. More interestingly, as you shall see, it puts a different hue on the performance of our beleaguered gold shares. I believe that the best way to check if something about a stock is really true or just mindlessly accepted is to view its chart over a period of time and then compare it to another company or other benchmark. So for our purposes I chose to put Berkshire (BRKA) along side of Goldcorp (GG,) the most representative and purest gold company. On the surface of things this appeared to be a ridiculous comparison. The universally hallowed Berkshire is selling at an unfathomable $133,600, a price fitting for wealthy sheiks or fired CEOs, but worthy of Berkshire’s heavenly aura. Lowly and unappreciated Goldcorp (GG) sells at a very earthly $36.00 with few public advocates, and rarely mentioned in the savvy financial media. You would have to sell almost 4000 shares of Goldcorp just to buy 100 of Berkshire. But in markets a lot of things are relative especially when you are dealing with performance. And what I discovered was quite shocking. Below are these results, along with some comments. 1) I had expected to find Berkshire Hathaway had shown some extraordinary returns that would justify the exaltation of its worshippers. But that is not the case. Very curiously, since 1998, and at almost every time period since then, Berkshire has not just done that well, and more interestingly, it has paled compared to Goldcorp. Now to the reverential, believing media, this statement might seem heretical, for witches were burned at the stake for less. In case you think I have been fibbing, here are the comparisons of Berkshire and Goldcorp during the past five and ten year period. You can check this in the above 5 and 10 year charts of each company. If you had been holding on to Berkshire Hathaway for the past 5 years, you have been rewarded with about a 12% yearly return. Not great, but not bad! But Goldcorp rose 360% or 4 times as much. That is pretty impressive. But the 10 year results were stunning. BRKA, from 1998 until now, has risen less than 75% or about 5% yearly, not exactly what I had expected nor something worthy of such adoration and worship. 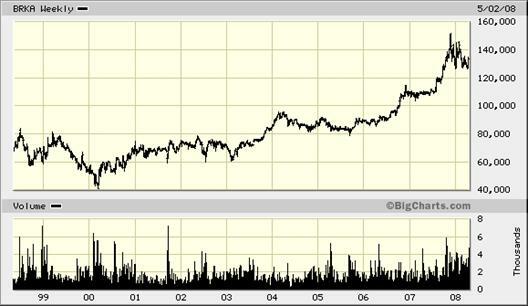 Goldcorp, held by few institutions, has gone up 1500% or 20 times as much. Now that is a move worthy of media mention and admiration but where have we seen this ever mentioned? Even the adoring Berkshire Hathaway holders might wonder why Mr. Buffett who is known for his uncanny foresight chose the WMD world of derivatives rather than gold. Only the Sage of Omaha knows. 2) Since BRKA cannot be considered an extraordinary investment vehicle over the past decade, as we might be led to believe from the media attention, it would be reasonable to expect some wall of worry as expressed in periodic large sell offs. But this also has not been the case. Now this is a rough eye inspection of the charts, but during this period it appears that Berkshire has sold off or corrected over 20% just 3 times and NOT EVEN ONCE in the past 5 years. Now never to get worried or shaken is faith almost of a religious nature, even when you consider that Berkshire has obviously made some serious strategic errors in the past year or so. But as I have pointed it out, owning Berkshire is a religious experience and not one to be doubted. And Goldcorp which only the perverse world of gold bugs would own has sold off at least 20% from 10-12 times since 1998 even as it rose 1500%. 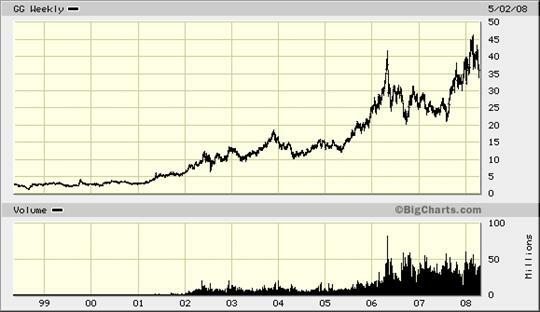 And since March 2003, as GG sold off over 8 times, it still managed to rise 360%. This type of contrary behavior has to puzzle most investing pundits who have steadfastedly warned of the gold “bubble” that would one day snare the unprepared and ignorant. Most advisors to this day advise the public to be careful and go with the proven quality such as Berkshire Hathaway. Given the comparative results wouldn’t you think that Berkshire has had to endure the sharp falls, not Goldcorp? Markets are amazing, and very often totally contrary to our expectations. What I wanted to show is that perception is not always reality. In great bull markets, stocks always seem to be swooning, flushing out the confidence of those who had seemed to be the most faithful holders while causing nearly everyone to wonder if the move is over. Few ever reap the entire benefit of a great move. Over any long period of time, it does not belong to the constant callers of near-term tops, but to the patient. Goldcorp is a legitimate example of this as it has moved up fitfully over the past 10 years with frightening sudden declines. On the flip side, venerated companies which over the years have become universally accepted and mainstream such as Berkshire Hathaway with its mythological leader always appear to be the best place to safely invest. We can also include Microsoft with trillionaire Bill Gates, and GE with the legend Jack Welch at its helm. And yet, over the past decade you could have done nearly as well in short-term money market funds as in BRKA. And you would have done worse with Microsoft and GE. Since 2000 you would have been scalped almost 50% in these two stocks. Yet, if you took some kind of main street or even Wall Street pulse which stock among the four (BRKS, MSFT, GE, GG) they would favor, guess which one would come in last? The purpose of this piece is to put things into a grounded factual perspective, not based upon a feeling but upon the historical results. Here is my conclusion. The mainstream approved companies such as Berkshire, Microsoft, GE, Citigroup, the housing sector have proven to be poor choices in spite of nearly universal acceptance. Yet, gold, silver and the mining companies have risen sharply these past 5 or ten years in spite of all of the public pessimism and ignorance towards gold. Now that our assumptions towards the untenable condition of the world currency system along with an ongoing sharp deterioration of the financial landscape are coming to pass, isn’t it logical to believe that the future will yield at least similar results, and even more likely, better ones? Please stop worrying and be patient. Isn’t logical that we are looking at a future world of great uncertainties and turmoil? I firmly believe that the next 5 or 10 years will dwarf anything that we have witnessed so far, but it might not be very pleasant or satisfying. If readers are interested in information on warrants or LEAPS, please visit our website. Dudley Baker is the owner/editor of Precious Metals Warrants, a market data service which provides you with the details on all mining & energy companies with warrants trading on the U. S. and Canadian Exchanges. As new warrants are listed for trading we alert you via an e-mail blast. You are provided with links to the companies’ websites, links to quotes and charts, tips for placing orders and much, much more. We do not make any specific recommendations in our service. We do the work for you and provide you with the knowledge, trading tips and the confidence in placing your orders. PreciousMetalsWarrants.com is not an investment advisor and any reference to specific securities does not constitute a recommendation thereof. The opinions expressed herein are the express personal opinions of Dudley Baker. Neither the information, nor the opinions expressed should be construed as a solicitation to buy any securities mentioned in this Service. Examples given are only intended to make investors aware of the potential rewards of investing in Warrants. Investors are recommended to obtain the advice of a qualified investment advisor before entering into any transactions involving stocks or Warrants. Due primarily to the California Gold Rush, San Francisco’s population exploded from 1,000 to 100,000 in only two years.